When it comes to highlighting innovative and successful social media campaigns and initiatives, WindFarm is ready and willing to make a big deal about them. Especially when they are happening in our own backyard of Sacramento, California. Enter The Sacramento Hashtag Project on Kickstarter. Why would a marketing agency cover successful projects that other people (and even other agencies) are behind? Because we believe everyone benefits from knowing about these successes, the people and agencies behind them, and also from the key takeaways brands might apply from these projects to help take their own social media marketing strategy to the next level. If you’ve haven’t heard of them yet, The Sacramento Hashtag Project has been using hashtags (#’s) online and offline to help connect Sacramento peeps to their local neighborhood and the things happening in them, including where they work, live, and play. They started by using and promoting hashtags offline where locals would see the hashtag picture frames in restaurants and coffee shops around the region. Then they partnered up with Code for Sacramento to build a sweet looking interactive neighborhood hashtag map where users can type in their address, find and see the hashtag for their specific neighborhood, and then see all the tweets put out their by local businesses, local projects, and neighbors (both good and bad). The platform provides an Interactive Neighborhood Hashtag Map for visitors to search and find their own neighborhood’s hashtag. It’s an application that tracks hashtags that people are tweeting in Sacramento and connects them to their corresponding neighborhood. It then creates a scale based on how many tweets people are tweeting in that area and displays them all for the user by date. Users can actually use the app to reply, retweet, or favorite from the app as well after connecting their Twitter account. And if a hashtag has never been created for a specific region, visitors can even dream-up and submit an idea for a new hashtag to be used for their neighborhood. Co-founder Mary Jayne Zemer states in their Kickstarter video they are using the project to build “camaraderie around the block” to help solve community problems, support small business, show some neighborhood pride, and have fun doing it (check out the video of their launch party). The innovators behind the project are using Kickstarter (a crowdfunding platform) to raise awareness and funds to support the first phase of their vision. This project will only be funded if at least $2,500 is pledged by Friday Jan 24, 6:00pm EST. So far, they’ve raised $722 from 10 backers. Other Sacramento area groups supporting the project include: PublicInnovation.org, The Urban Hive, and the Sacramento Social Media Club. Organizers mention on their Kickstarter page that within the first few days of our official launch, the number of people using their neighborhood hashtags on Twitter more than doubled. 1. Small Business Gains from Being Hyper-Local. If the Sacramento Hashtag Project is successful in getting people to adopt and use neighborhood hashtags, small businesses in the region could use the tool to rally support to find and engage with the customers and prospects who are right in the neighborhoods they serve. 2. Offline Promotes Awareness and Connection Online. We are big advocates of an integrated strategy for any organization. 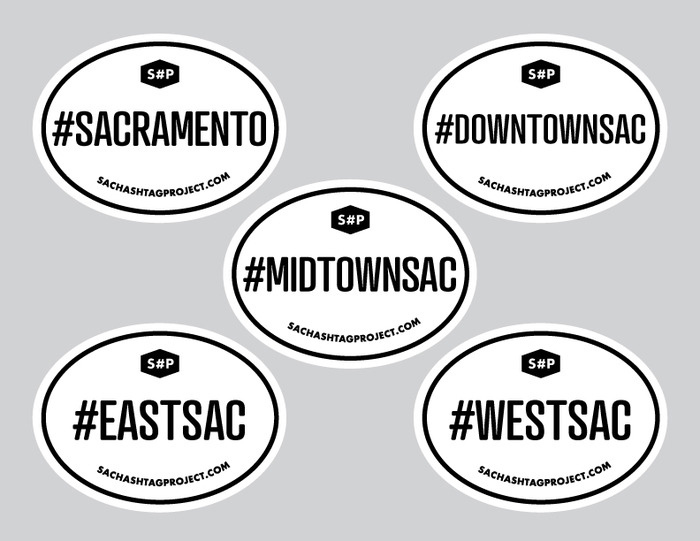 Using hashtag stickers and print collateral to encourage those who are visiting physical places of business and area locations is a win-win-win for everyone: the business, the neighborhood, and The Sac Hashtag Project itself. 3. Crowdfunding Could Power Your Next Big Social Media Campaign. WindFarm believes the Sacramento region has the potential to lead a new path of collaboration between marketers, artists, writers, and techies who are using social media, digital applications, and inbound marketing methodologies to make the world around us a better place and also to improve the way we do business. Keep an eye on California’s State capitol as a hotbed for building and launching innovative and disruptive initiatives that end up making a big splash for communities, organizations, and brands people love. To support our soon-to-be friends behind the project, check out their website, connect with them on Facebook and Twitter, and DONATE to help get this thing off the ground.